We started Siemsatec in 2005 with a vision to be smart, modern and innovative with a friendly approach. The fast pace of technological advances means you have to adapt to an ever-changing climate in BMS in order to create smart, efficient systems. We aimed to become leading industry experts in BMS, installing quality systems that are tailor made to work perfectly for our clients and their needs. In order to do that, our growing team of specialists on 4 core aspects of our service to our clients. No building or client is the same. Therefore, every BMS we design, manufacture and install is tailored specifically to the needs of our clients and their buildings. We aim to offer our clients a personalised service with one main point of contact. Not only is it important to us that you get a modern, intelligent system, but you get a system which works exactly how you need it to with easy to use functionality. Despite our many years’ experience in BMS, regular training is still important to us. We want to ensure we’re always in touch with the latest technologies to give you the best advice on your BMS. Our engineers are kept up to date with regular training and all have attained Trend Expert status. We’re always striving to make sure we’re ahead of the competition and have the most up-to-date industry knowledge so we can provide a truly modern and high quality system. Siemsatec is an approved partner of Trend, and with close associates we are also able to offer Johnsons, Priva and Honeywell, all leading industry manufacturers. Combined with our experience and our dedication to our profession, we’re confident that you’ll agree our work is of the highest quality. A critical part of any works is having the peace of mind that everybody on-site is safe and free from serious injury or harm. 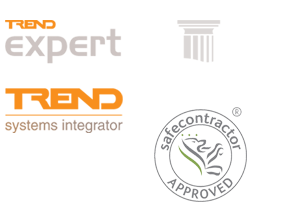 Our engineers are fully accredited by Safecontractor and Constructionline. Whatever the size and scope of your BMS project, we have the skills to take the care needed to ensure strict health and safety requirements are met at all times.